Let’s get the inevitable comments out of the way. 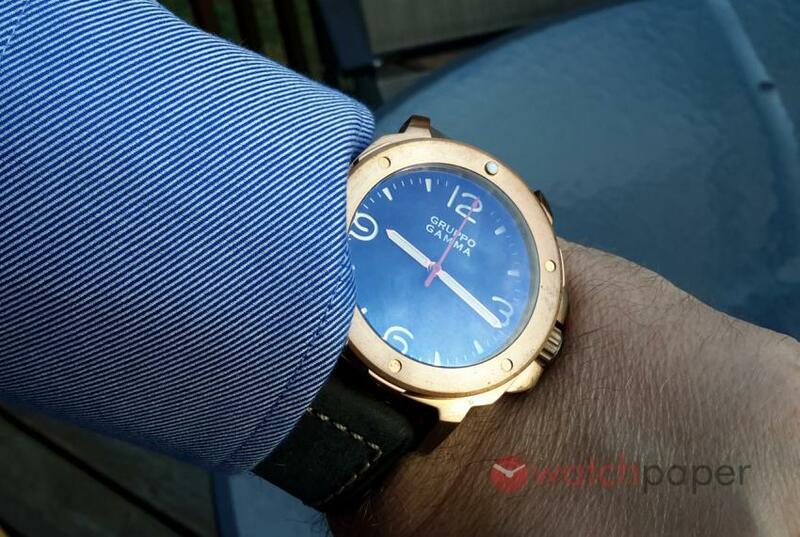 Gruppo Gamma watches are clearly influenced by Panerai. Now let’s move on! There is a lot more to this watch than a similarity between its numerals and those on a PAM. I have spent the last month wearing (on and off) a Gruppo Gamma Bronze Vanguard. 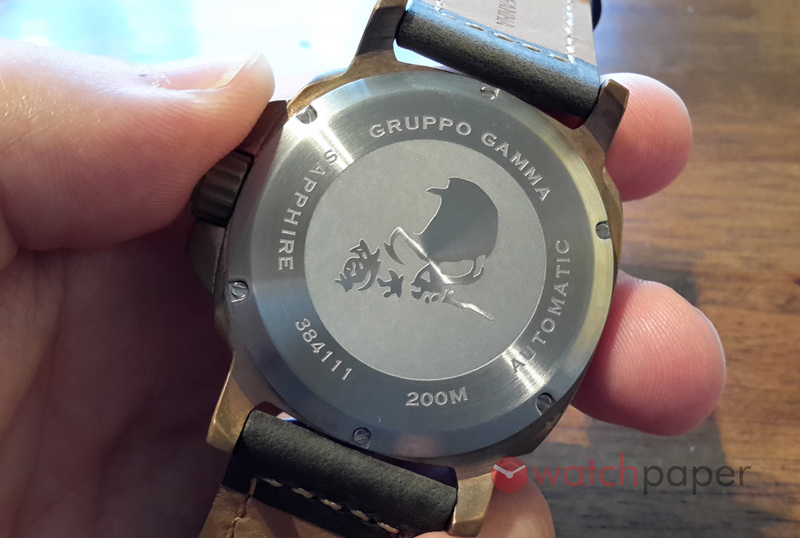 Gruppo Gamma is a micro-brand from Singapore and Adam thought it would be cool to have a Paneristi review one of their watches. Gruppo Gamma kindly sent me this bronze bad boy to review. And I am going to tell it like it is. I had never even seen a bronze watch before. When I opened up the Bronze Vanguard, I was like, “Boom! 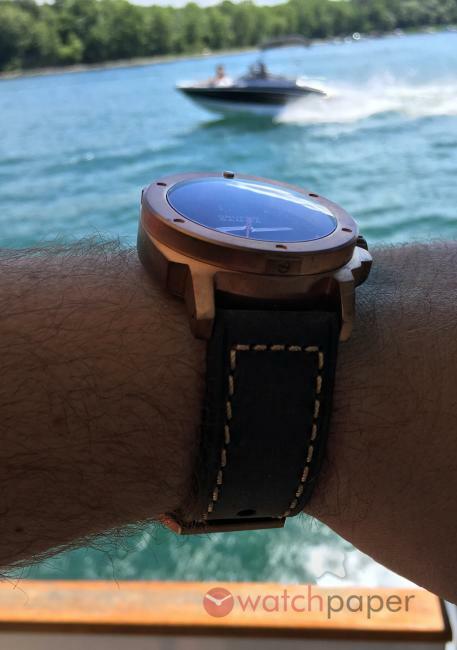 Hello!” The watch was on the brown leather strap and the colour combination is stunning. I was on my way to special dinner with my wife and I was wearing blue. 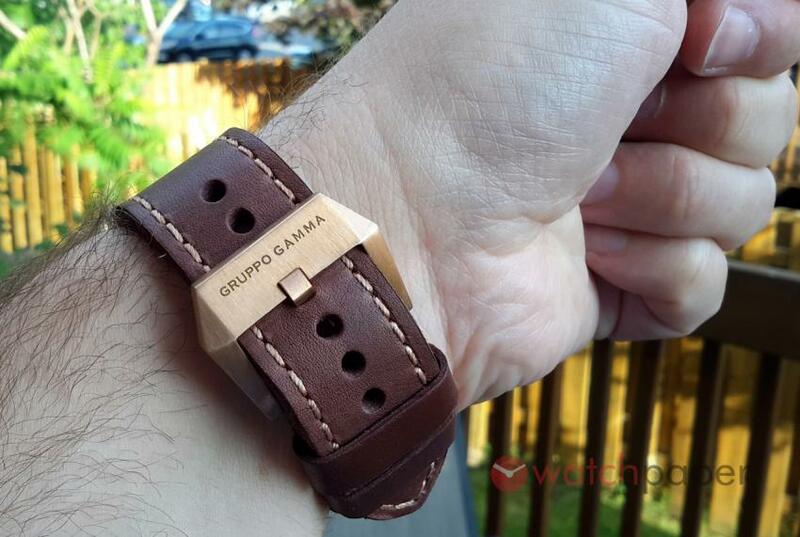 I strapped on the Gruppo Gamma immediately because the look was irresistible. The highlight for me was the huge bronze buckle, which looks more like a Bell & Ross than a Panerai. The whole bronze look felt just awesome. Aside from the numerals and sandwich dial, there is nothing really PAM about this watch, in my opinion. The dial has a red sweeping seconds and minute markers, making it very simple and easy to set the time. I love these type of simple and bold dials. Having no date is perfect for a casual watch and having a sweeping-seconds gives you all the functionality you really need. The case is just nuts — I’ll get to that later. Both straps are just awesome and really fun to wear. My main concern, at first, was the Miyota movement. But the watch has been running within +8 seconds per day, which is excellent. I found the movement to be really solid. The seconds hand moves in a buttery smooth manner and the winding is smooth, too. Does the movement excite me? No. Can I find any fault with the movement? No. But now I am going to fast-forward and tell you the conclusion. This watch is big. It is extreme. There is no way you are ever going to wear this watch to any business meetings. It is too damned big and bulky to fit under any dress shirts. 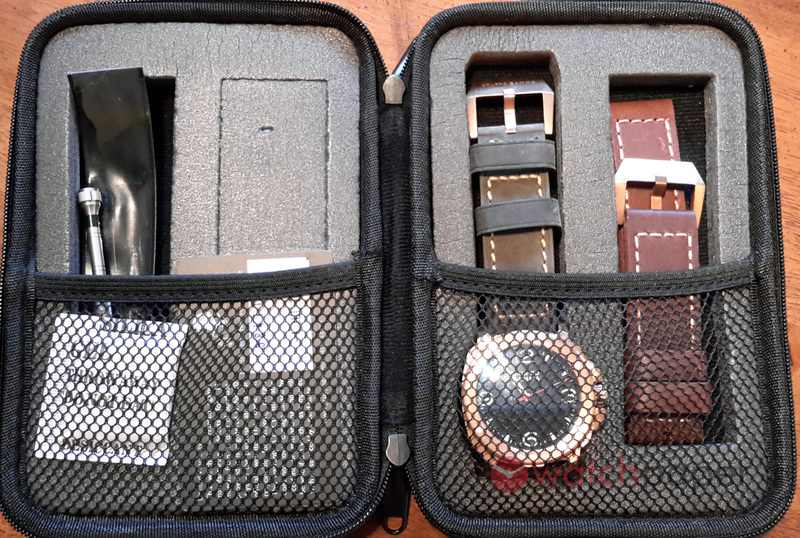 The 44mm case sits too high and proud to fake any formal duties. I call it a “weekend BBQ warrior” because this is the piece I want to wear to my buddy’s back yard BBQ. It is so big that it feels like you can smash everybody else’s little girly watches into pieces with this bronze beast. The strap, as I have mentioned, adds to this macho feel. It is gorgeous and thick and makes a statement on this wrist. Wearing the Bronze Vanguard is like wearing a piece of marine equipment on your wrist — not suitable for the boardroom but perfect for the weekend. The great thing about bronze is the colour. It looks cool. It adds a whole new dimension to your watch collection. In only one month, this Bronze Vanguard has started to age with some patina. It is fascinating to see. It’s like watching a plant grow in your house — every day it evolves just a little bit. 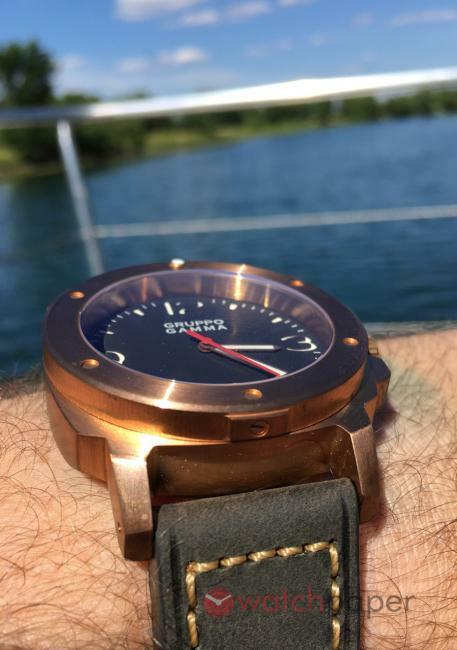 When you combine a bronze case, bronze buckle and matching stitching on the strap, you get a gorgeous colour combo that just pops on the wrist and makes your outfit come alive. Since Gruppo Gamma includes two straps with their watches, you get all of the fun of alternating and matching different colours. 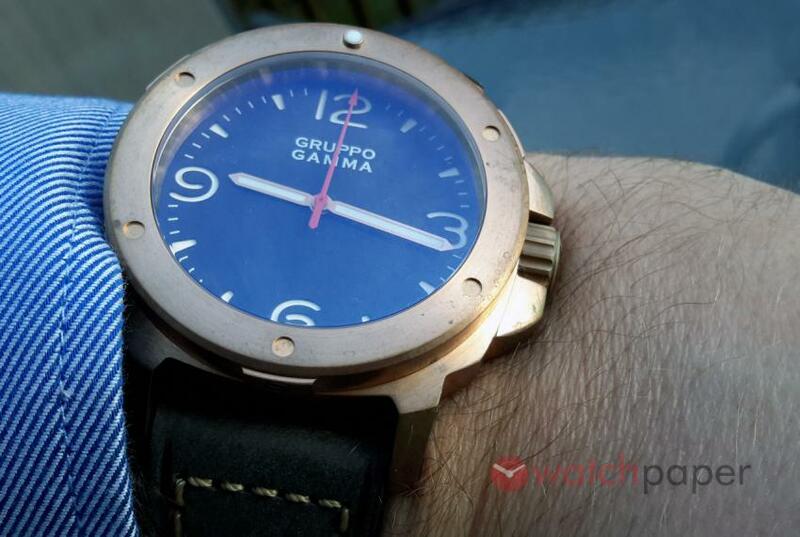 The Gruppo Gamma Vanguard is a very affordable watch. This could be an awesome watch for a young guy who is buying his first proper watch. It would also be a great addition to the watch box of a seasoned collector who craves a unique piece. Any collector who does not yet have a bronze watch should consider one of these. It’s a niche-watch — I don’t think you want to wear it all the time. But you will always have occasions or events where you want to show up with something cool and unusual. In these cases, your Bronze Vanguard will stand out.